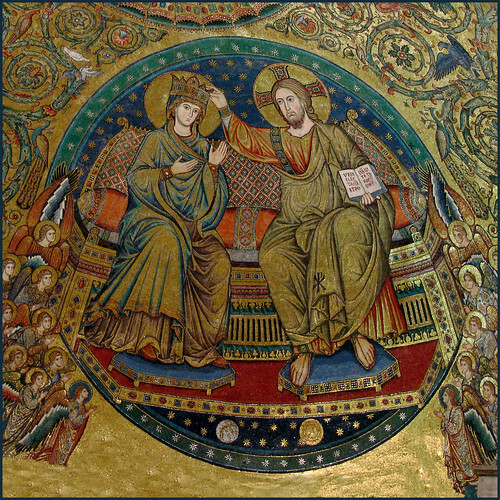 Christ Crowns Mary, Basilica of St. Mary Major, Rome, originally uploaded by Edith OSB. This year finds me celebrating the Solemnity of the Assumption – and the anniversary of my First Monastic Profession (“first vows”) with my friends at the Abbey of St. Walburga in Colorado. We are also preparing for the funeral of one of the sisters on Monday. The two celebrations are really of one piece. The Assumption shows us, in its most perfect form, the glory of a human life lived in holiness and selflessness – with the Blessed Virgin joining her Son on his throne. On Monday, we will celebrate a life of simple holiness and service to others, of kindness and support. At the close of our Rome Renewal Program this summer, Sister Karen Joseph, OSB gave us a new way of looking at our monastic professions. She said that, on the day we made our Profession, we were telling God, the world, our community, and ourselves, “This is who I want to be: this Rule, this community, this way of life.” Each day, we can ask ourselves – what do I need to do today to become that person? This day, we can give thanks for the example of those whose lives of holiness give us courage and inspiration – and we can pray for the grace of God’s transformative power to help us on our way. I find these thoughts so encouraging. I have only been a sister 5 years coming to my call late in life. This is what I need to remember in my every day life, why I chose this life and who I believe God wants me to become. Thank you for your comment. I came to my call late in life too.